The City of Melbourne recently invited comment on their draft Heritage Strategy. Below is MHA’s submission, which focused on gaps in heritage protection and issues with the management of heritage places and heritage listings. We are glad to see the City of Melbourne undertaking this study and are pleased to have been able to provide comments on the draft. We look forward to reading the final document. Precincts not reviewed since c1980 when simply given a name and assumed to cover significant + intact areas and high quality / intact buildings. Reason for precinct not necessarily self evident any more. New precincts should be created where there are other concentrations of individually listed buildings, or will be as a result of the 99 buildings study, e.g. the intersection of Bourke and Russell, the Spencer Street Hotel precinct. The are also areas that make good precincts as representing industrial heritage esp Guildford Lane, and concentrations of less grand laneways ‘little’ street and laneway buildings, and laneways themselves esp. the Little Bourke / Hardware Street ‘lanes’ area. Existing precincts may need to be broken into smaller parts, or in other cases it may be useful to extended them to cover similar building stock immediately adjacent, e.g. buildings already covered by HOs on the west side of Elizabeth Street could easily be incorporated into the main retail precincts on the east side. Precincts Project 2001/2 recommended extension of Flinders Lane and Flinders Gate precincts. Existing precincts often do not match the rather short Statements of Significance. They often often do not apply to all the places within the precinct, e.g. 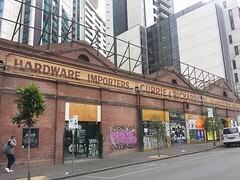 the Edwardian industrial buildings in Little Bourke Street are included in the Bourke Hill precinct, but the Statement of Significance only refers to buildings on Bourke Street or in the lanes. The creation of the 99 buildings list was not from ‘first principles’ but based on previous lists whose criteria were woolly at best. Certainly did not cover all C grade buildings, though majority were C grade. Some on previous lists left out. Mainly chosen for architectural quality. It would be worth considering whether all intact places built pre and immediate post gold rush (ie. before 1860) should be listed automatically. Industrial or at least ‘back-street’ buildings probably still under-represented. There are many buildings of little architectural pretension that face only onto lanes, a building type that is more common in the CBD than elsewhere. There may be a case that most or all such buildings built pre WWII are worthy of protection. The Central City Heritage Review 2011 included 8 modernist places from the 1950s-70s, and none from the 1980s. Given that nearly 30 years have now passed, it is probably time to consider places from the 1980s. There are a relatively small number of outstanding / award winning places that remain intact in the CBD, but they may not stay that way without protection in the near future. For example the former Shell House by Harry Seidler (1988) and 222 Exhibition Street by Denton Corker Marshall (1989) were both highly praised at the time, and remain quite intact, but have both been recently sold. About 12 interiors in the CBD were to be listed as part of the Central City Review, but there are many more. MHA has investigated dozens of places with perhaps 30 pre WWII interiors worthy of consideration. A comprehensive survey needs to be undertaken. 4. Objects / infrastructure / private public art. Such street objects as horse troughs, gas lamps, cast-iron urinals etc. are routinely added in heritage studies, but the City of Melbourne, where there are a wealth of such objects, has never undertaken a comprehensive survey. A list of such objects, including statues and monuments that are not in parks, was provided as part of the 1993 CBD study. There will be a small number of other objects, such as the 1920s cast-iron lamps in Collins Street east, and some privately owned 1960s public art, such as the Meadmore sculpture recently removed from the former AMP tower plaza. Shopfronts are sometimes noted on building datasheets, but are rarely highlighted and might be altered without a permit by the buildings owner. A shopfront study was undertaken by Council with the National Trust in 2000, and the results noted on datasheets, which are no longer consulted, and the study itself has been forgotten. Any building with an HO or within an HO area with an intact notable shopfront should be highlighted when an application is made. Consideration should be given to an HO applying only to a highly notable shopfront even if the building itself is not individually significant. Painted advertising signs and structured signs such as neon are sometimes noted on building datasheets, but they have never been highlighted and can easily disappear or be damaged. Where they exist on front or side walls, or even rear walls they should be noted on the database. Some highly significant sign may be worthy of an HO even if the building itself is not individually significant. The lanes in the CBD are integral to its significance, but there are no specific heritage controls for them, or the buildings that face only onto them. The infrastructure of lanes (cobbles and gutters) are often integral with the side or rear of buildings, and the front of some buildings, which lends them a strong heritage character in total. Consideration be given to listing some lanes as sep heritage objects, and even some lanes and all abutting buildings or at least walls as heritage places in their own right. The City of Melbourne uses the A, B, C, D gradings system. The currently preferred system is that recommended by the DPCD, namely grading only those places covered by an HO as either “Individually Significant” (whether within a precinct of not), “Contributory to Precinct”. The flaw of the current system is that the ‘low grade’ of C and D places is often used to justify demolition / extensive alteration, and many of the places outside precincts are only C graded (eg. almost all the places in the 99 buildings study). Furthermore the gradings were undertaken in 1984, and in the CBD have never been reviewed, and are very much out of date. The current guidelines for places within the CCZ are extremely short and unhelpful, essentially saying only that a CMP should be prepared. There is little point having heritage listed places when the controls that one would expect would ‘preserve’ them are so vague. Since the CMP is usually commissioned by the owners consultants, they can be manipulated to justify extensive alteration. We understand that this was a reaction to previous controls that virtually outlawed demolition of what were once called Notable buildings (mainly A graded buildings). Various compromises and standards were nevertheless developed that showed that this was not as strict as it was written. A suite of guidelines should be developed similar to those for all other municipalities. They may entail ‘should’ rather than ‘must’ statements, but it would be useful for all concerned to know what is considered acceptable and what is not, rather than old standards being gradually replaced by new precedent-setting permits. Only developers would want to see ‘facadism’ like that proposed for the Celtic Club to become an acceptable outcome. Guidelines for city buildings would at the very least strongly discourage facadism and dominating rooftop additions. Different standards would logically apply to ‘Individually Significant’ and ‘Contributory to a precinct’ places. Guidelines for interiors, objects, laneways and modernist places would also need to be developed. Current heritage project funding is quite minimal, with the Melbourne Heritage Restoration Fund able to disburse only relatively small amounts. While this is pretty much the case across Australia, except for the City of Adelaide whose fund has disbursed $15 mill since 1988, Melbourne should be able to do more in this regard. CBD buildings often require far more than the average house restoration or repair, and owners (especially of mid size buildings) are often unwilling or unable to match funds, and would prefer a grant to a loan. The United States is a leader in this field, with tax rebates, and local government and state programs of grants and/ or various tax rebates. These are often responsible for a restoration project to ‘get over the line’. While income tax heritage rebates are not currently possible in Australia, the City of Melbourne in concert with the State Government could do more to ensure the restoration of the heritage buildings of the CBD, which are rightly considered the most significant in Australia. 1. Greatly increase the amount that MHRF can disburse. This could be on-going inputs by Council eg. $1/2 mill / year, or via a small percentage of CBD rates being channelled into the fund for one year, or a limited number of years, or on-going. 2. The City of Melbourne can offer rate rebates/ holidays for specific properties that are willing to spend the equivalent amount on restoration. This could be coupled with State Government Land Tax rebates / holidays. 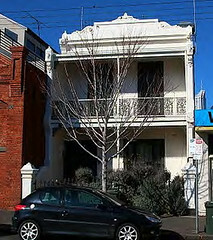 The latter are already possible for places on the Victorian Heritage Register, but rarely used. 3. Target a specific area for restoration. For instance draw a line around Swanston Street and all the properties facing it and allocate a % of the rates from that area towards restoration, repainting, or feature lighting or just better signage, so everyone gets something. 4. Target a building where restoration will result in higher rates, and recoup some of the grant that way. This could include recreation of facades where much of the detail is lost, but exists in photographs, or on the adjacent matching building, or where there is a ‘hidden’ façade that just requires the removal of later cladding (eg. Target Bourke Street façade covers over the 1916 Hoyts DeLuxe).